This will be the only post today. The new site launches Monday, and I'm spending the day porting all the posts over, and then the weekend making sure everything is ready. I know you didn't read the Zone Stretch article from yesterday, so go back and read that. My quest for some daily/semi-daily feature here at GS which isn't just some half-baked ripoff of MGoBlog's Unverified Voracity continues, without much luck, but I press on. If you've got an idea burning a hole in your pocket, shoot them an email. Silverman has been talking to Tom Anastos and Bruce McLeod, commissioners of the Central Collegiate Hockey Association and Western Collegiate Hockey Association, about trying to get more games on the air. ... Silverman said the most-sought-after games would be those involving one Big Ten school playing against another. Michigan-Michigan State games are are all televised in some form or another, but that might mean trips to Columbus -- rarely provided full coverage -- are televised in the future. ... if you're not going to attribute something you probably shouldn't take a screenshot of the blog. Attention, sports-talk-radio interns: you can right click on any picture and "save as". Also, your thumbs are opposable (probably) and can be used to open things like doors. As referenced above, "Cry, Cry Again" is the arty movie that Jerry refused to bootleg for Brody, so Kramer does it himself - poorly, according to Jerry, who now thinks of himself of an expert in bootlegged movies. The end of the movie is taped over by Elaine, who filmed herself dancing to see how bad she really was. Michigan has lost five of the last six games to OSU, and their fans have cried and cried again over this development. The Wolverines are trying to get their mojo back with the hiring of Rich Rodriguez - not unlike the character in "Cry, Cry Again" who buys a loaf of bread. Quote: "He's trying to buy a loaf of his soul." Meet Rich Rodriguez - a loaf of soul. Hokay. I'm out. Wish me luck. 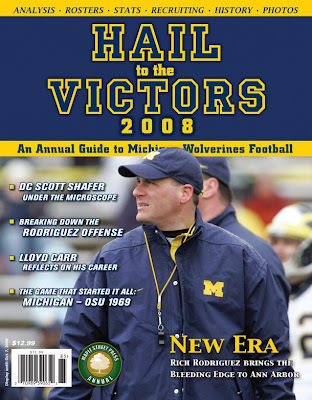 This article was originally published in Hail to the Victors 2007. The 2008 edition contains a followup piece contrasting the Michigan stretch with the West Virginia zone read. It's guaranteed to get a passing mention in every Michigan preview out there... but what is it, exactly? EVERYTHING WENT WRONG in 2005, the Year of Infinite Pain. Beset by injury, poor play at critical positions, and ill fortune, Michigan stumbled to a 7-5 record in their worst season since Jim Harbaugh's broken leg sent the 1984 Wolverines into a 6-6 tailspin. In the aftermath, changes were instituted everywhere. Defensive coordinator Jim Herrmann was replaced by Ron English. Offensive coordinator Terry Malone left for the Saints. Steve Szabo was brought in as Michigan's linebackers coach. Ron Lee became the cornerbacks coach. However, the biggest change came not in the names coaching but in Michigan's philosophy on the offensive side of the ball. New/old offensive coordinator Mike Debord, the Grover Cleveland of Michigan athletics, had a departure in mind. When practice reports started diffusing out of Michigan's spring sessions, it became clear just how drastic the departure was going to be. Michigan's linemen were all asked to drop 20 to 30 pounds. [And that worked so very well. -ed] Famed Broncos offensive line coach emeritus Alex Gibbs was brought in to consult. The isolation plays that had been a staple of the Michigan offense since time immemorial were shelved. Linemen started moving in unison like extremely large, unattractive ballet dancers. Guards would no longer pull. Holes would no longer be designated before the play. And a newly healthy Mike Hart would be tasked with finding a crease, any crease, instead of attacking a designated hole. The zone had come to Michigan. But just what is this zone thing? It appears to describe any and every successful running attack out there, from the Denver Broncos to the Atlanta Falcons to the Minnesota Golden Gophers to, yes, Michigan, but the surging popularity of the term threatens to wash away its meaning much like what happened to the “West Coast Offense,” a term now applied to any unit less cro-magnon than Marty Schottenheimer's. How can Michigan, which didn't pull a lineman the entirety of 2006, and Minnesota, famous for pulling centers, guards, and even the occasional tackle, run the same offense? And what kind of meaning could it have if they do? In its simplest form, zone blocking is much like the wide receiver option routes that are all the rage: read the defense and do what is most effective against it. Take a simple dive play where the running back is supposed to run it right up the gut. A traditional blocking scheme could go one of two ways: block everyone man up or have the center block down on the defensive tackle while the guard pulls around to block the middle linebacker. But there are problems with this. Usually a defensive tackle is lined over a gap, which makes him a difficult block for the guard man up. (We'll see an example of this issue in a few pages.) When the down block is attempted defensive tackles are smart and quick enough to crash into the backfield at high levels of play. Often a defensive tackle will stunt or pinch into the designated hole, fouling the running play by forcing a tailback to run up his lineman's back even if the defensive tackle doesn't make the tackle himself. A zone block allows (or forces, depending on your point of view) the offensive linemen to react to the defense after the snap. In traditional schemes, a slanting or stunting defensive tackle is either going to run himself into the play or out of it and you just have to hope it's the latter. This would be analogous to running a combination route designed to defeat zone coverage even when the opponent is clearly in man. You're putting yourself at the mercy of the opponent's decisions. 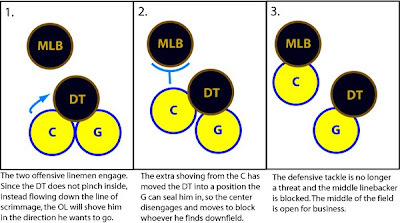 Zone blocking removes this problem by getting double-teams on critical members of the defensive line, then releasing those blocks in a certain fashion that depends on what the defense does. The end result is a flexible, resilient set of interior blocks. Engage. Both linemen take a step to the side the play is going and meet the defender. At this point the most important thing to do is get close enough to your blocking partner to remove any possibility the defender will split the double. If this happens, there is a high probability the play is going for no gain or a loss. Then the linemen must drive the defender backwards, or at the very least prevent him from getting penetration. Seal. The two offensive linemen now read the motion of the defender and determine what they're going to do. Since the two linemen have cut off the area between them, the defensive tackle has to attempt to go one way or the other around the block. This is usually set before the play. He'll be slanting inside or trying to maintain the point of attack. It should be fairly obvious which direction he's going; once it is, one blocker will become the primary. It's the secondary blocker's responsibility to shove the defender into a manageable position for the primary. Peel. At this point the defender should be moving away from the line of scrimmage and walled off by the primary blocker. The secondary blocker disengages from the lineman and moves to the second level, where he blocks anyone he comes in contact with. Ideally, this system gets you the benefits of a double on the defensive tackle without sacrificing the ability to get second-level defenders blocked. Zone blocking is a fairly basic concept any team can employ on a variety of different running plays. Zone running is something this article would like to distinguish from it. Zone blocking is often trumpeted as a team moving towards a Denver Broncos style of running that will relentlessly churn out yards no matter the back. Then when the season rolls around nothing seems different. Michigan made a much more drastic change by making one particular play the bulk of its run offense. Zone running comes in two flavors, inside and outside. The “outside zone” is often referred to as a “zone stretch” or just a “stretch” play. The sizable majority of Michigan's running plays last year were zone stretch plays of some description. This is a vast change, akin to calling pitch sweeps or draws on 80 percent of your running plays. What is the zone stretch? A run play that's uncommonly tough to predict, one generally resilient against stunts, slants, and shifts. It can deal with extra players in the box by without having to actually block them. It radically improved Michigan's run game in one offseason. But, yes, there is a catch. We'll take a look at three different zone plays in the next few pages, focusing on a failed zone block and a successful one before zeroing in on one particular flaw the stretch, even a well-run one, has against defenses prepared to stop it. The most important thing on the stretch is to get all the “first level” defenders blocked. Normally these are defensive linemen, who can shoot into the backfield and force the running back to waste time before he gets to the line of scrimmage, but a blitzing linebacker makes himself a first level defender. And sometimes defensive linemen aren't considered first level, usually backside defensive ends who are suffered to run free so that the tackle lined up over him can instead block a second level defender. Our first play features a first level defender suffered to run amok. It's Michigan's opening drive of the Notre Dame game. Michigan already leads 7-0 after Prescott Burgess's interception return touchdown. On first down, the Wolverines run a zone stretch to the left side of the line for four yards. Facing second and six, they line up in a three-wide ace set (for those who haven't wasted significant swaths of their lives playing EA NCAA Football, an ace set features one tailback lined up behind a quarterback under center as opposed to an I-formation, which has a fullback lined up in front of the tailback). They're going to run another zone left. Notre Dame sticks with seven guys in the box. Please see Figure 1 for the presnap alignment. On a zone stretch the line moves in unison to one side or the other, blocking whoever they find in their area. But a rote adherence to this concept can leave first-level defenders unblocked. On this play, defensive tackle Derek Landri is shaded to the playside, lined up over the gap between the center and the guard. Asking a center to snap the ball and then get his helmet across a player who is already a step ahead of him is asking for a defensive tackle in the backfield. With the defensive end and outside linebacker shaded to the outside themselves, left guard Adam Kraus has no one in his zone. He could help out on Landri, but he doesn't, instead stepping left into his vacant zone and immediately going out to the second level to block the middle linebacker. Figure 2 shows the actions of all participants immediately after the snap. Bihl's left alone to block Landri; this works about as well as you might expect. 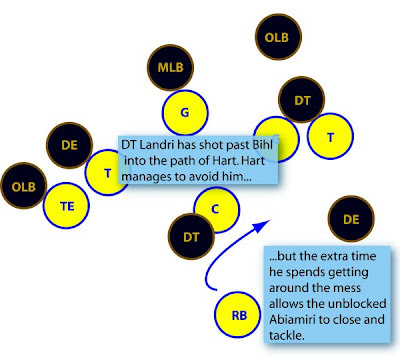 Landri shoots into the backfield, right into the path of Hart. Hart being Hart, he dodges the charging lineman, but the play's timing has been disrupted. The unblocked Abiamiri wraps Hart up for no gain. Figure 3 shows the play's result. It's not a good one. Michigan is stopped for no gain. The frustrating part of this play for an offensive coordinator is that it was blocked wonderfully aside from the slip up on Landri. By the time Hart was being tackled, Trevor Laws, Notre Dame's other tackle, had been driven five yards downfield by the Riley-Mitchell double team. Riley then completed his zone block by peeling off and hit the outside linebacker. 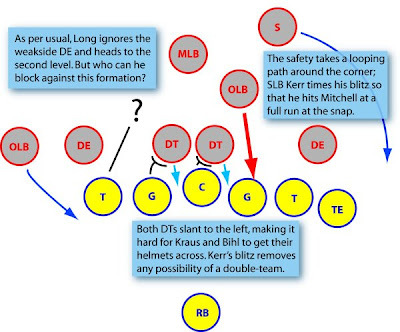 Kraus took out the middle linebacker... if he had just managed to get Landri sealed before he did so Hart would have had a major crease, as you can see in Figure 3. On the ensuing third and medium, Chinedum Ndkuwe intercepts Henne and returns the ball inside the five, giving Notre Dame their one brief moment of hope in the midst of a wholesale beatdown. Our next play shows the power of a successfully executed zone block. Later in the first quarter, Michigan leads 13-7 and has a first and ten from the Notre Dame 27. Mario Manningham has just found himself “oh, wide open” for a 70 yard touchdown; Obi Oluigbo forces a fumble on the ensuing kickoff. Michigan looks to take control of the game. On first down, Chad Henne dumps it down to Oluigbo for nine yards. On second and one from the eighteen, Michigan lines up in an ace set with two tight ends lined up to the short side of the field. Notre Dame responds by shifting their linebackers to the strong side and moving Zbikowski up to the edge of the box. They should have a numerical advantage here on this short yardage play. 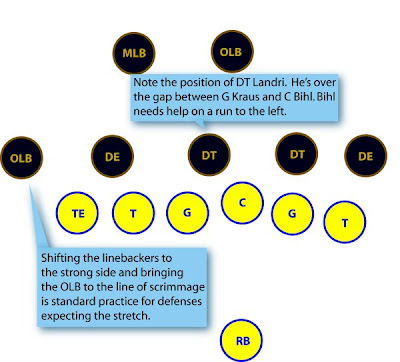 Michigan will zone stretch to the strong side of the formation. The alignment is nearly a mirror image of the first play: the Notre Dame defensive tackle (this time Trevor Laws, who is a plugger but not the sort to knife into the backfield like Landri) is shaded to the strong side of Bihl. Landri is on the backside, lined up directly over Adam Kraus. This time, Kraus will cut Landri while Bihl and Mitchell execute a zone block on Laws. Long will angle upfield. The backside defensive end is again left unmolested. Figure 4 shows the presnap alignment and initial actions of all players. Let's take a moment to focus in on that zone block against Laws. Figure 5 has a breakdown of the process. Both players engage the defender, who is stepping right along with the offensive linemen in anticipation of the stretch. Since Laws is flowing down the line of scrimmage the decision is made to pass him off to Mitchell. Bihl shoves his man into place, pops out on the middle linebacker, and creates a seam for Hart. This is a textbook zone block. If Laws had pinched inside it would have been Mitchell shoving him so that Bihl could get a seal on him and releasing into the middle linebacker. Hart has to read this block and pick the appropriate side of the DT. He does this, cutting back to the left behind Bihl. Long gets his second level block on Travis Thomas, Kraus chops Landri's legs out from under him, and the red sea parts. Figure 6 shows the successful execution of the play. Weakside defensive end Ronald Talley futilely waves an arm at the passing Hart. The linebackers are washed out. By the time Hart meets opposition it comes in the form of an arm-tackling cornerback and safety Zbikowski running away from the line of scrimmage. They manage to take him down after ten yards and a Michigan first down. Hart would score a few plays later to give Michigan a 20-7 lead. Intelligent linemen. 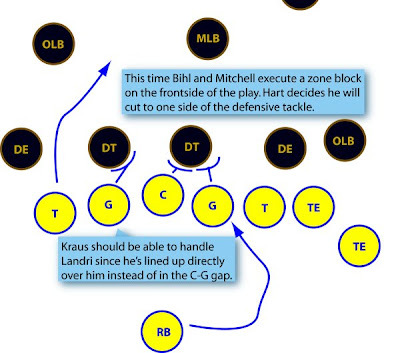 On the first play a mental mistake from Kraus put Bihl in an untenable position. Each lineman must understand his responsibilities as they shift based on the pre- and post-snap alignment of the defense. 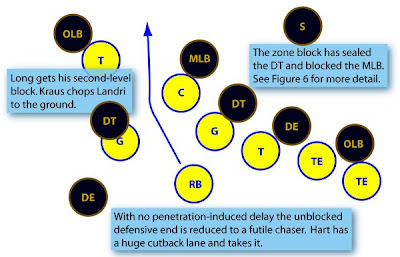 The zone block that opened up Hart's lane on the second play is something the two linemen working on the defensive tackle must coordinate as the play develops. Agile linemen. The blocking on a zone stretch play usually consists of escorting linemen where they want to go and relying on a double or a mistake to open up a seam. Overpowering your man one-on-one and driving him into the ground hardly ever happens. How could it? Instead of firing off the ball, linemen start running nearly parallel to the line of scrimmage. Sometimes you'll see a defensive tackle end up way downfield, like on the first play, but he's usually being doubled. The zone isn't about power. It's about getting to the right area on the field as quickly as possible and walling off the defense. You have to get to a spot and and hold your block; if you're peeling off a double team you have to get out on a second-level defender who's already reacting to the play. A running back with vision and cutting ability. Just as the zone-blocking offensive linemen are improvising within limits on the fly, so is the running back. Without a designated hole, the tailback must read the blocks as the play develops and ruthlessly attack when any seam opens up. Hart's the perfect back for this sort of offense. Meanwhile, Kevin Grady has struggled identifying where he should cut and has mostly been deployed on outside pitch plays that require less vision. You can also see what Mike DeBord means when he says that the zone sometimes allows you to “run away” from an eighth guy in the box. He means it literally: on both these plays the backside defensive end is completely ignored by the tackle he's lined up over. In both cases this allows Michigan to get that tackle out on a linebacker. By any metric, the zone worked. Michigan ground most of their opponents into dust. Yards per game jumped from 161 to 175 (maybe that doesn't sound like much, but keep in mind that games were approximately 10% shorter last year because of the late, unlamented Rule 3-2-5e). The rush offense's ranking went from #44 to #21. Yards per carry leapt from 4.3 to 4.9. Mike Hart found the first success of his career against Ohio State and was held under 90 yards just once, when the offensive line elected to not participate in the Rose Bowl. The zone was good to Michigan. But it wasn't all sunshine. One of the lone bright spots during the Year of Infinite Pain was the team's short-yardage third down conversion percentage, which was well above the national average even during Michigan's worst season in 20 years. Michigan was 20 of 23 on third and one, an 87% success rate. The national average was about 69%. Michigan converted 64% of its third downs that were three yards or shorter; an average team would have converted 61%. Michigan's emphasis on out-executing their opponents instead of out-thinking them has always and will always work best when the odds are heavily stacked in their favor, like on third and short. Michigan's iso-heavy style in 2005 may have been But when you radically revamp your rush offense to feature a slow-developing outside run play and try to run it out of a three wide set on third and short, things don't go so well. Michigan dropped to 11 of 19 on third and one, a 58% conversion rate nearly 30 points lower than their 2005 number. Their overall conversion rate on third and three or less dropped to 51%, well below the 60% a hypothetically average team would have converted (some small differences in average distance between years changed the average conversion rate) . The bottom dropped out of Michigan's short-yardage conversion rate despite the marked improvement in all other facets of the run game. This happened because Michigan's aforementioned radical conversion, though successful, was too radical. A zone stretch run into a stacked defensive front intent on penetrating into the backfield is asking for the punt team to hit the field. Take this play from last year's Ohio State game. It's early in the second quarter and the teams find themselves tied at seven. A second and 13 wide receiver screen to Manningham sets up a third and one from the Michigan 23. Michigan lines up in its usual three-wide ace set. Ohio State responds with something, well, thoroughly weird. Figure 7 shows the presnap alignment of both teams. This is all haywire from how you usually defend the zone. Normally you will have a linebacker pulled up close to the line of scrimmage, but on the strongside. Here it's the weakside backer. On the strongside, John Kerr is lined up right next to James Laurinaitis, seemingly unprepared to stop anything that gets outside the defensive end. And the placement of the defensive tackles shoulder-to-shoulder with the defensive ends spread out in their usual place outside the offensive tackle is seemingly crazy on third and one. 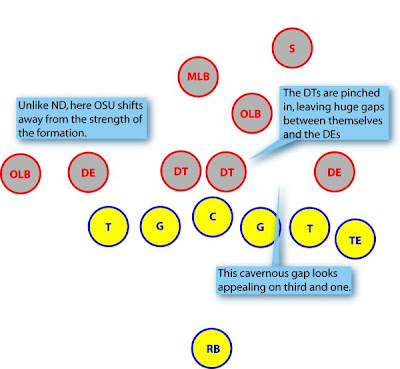 A team could just slam its way to the first down by exploiting the cavernous gap between the defensive end and tackle. What is Ohio State up to? On the snap it's revealed: blitz blitz blitz. The weakside linebacker tears into the backfield. The curiously-positioned Kerr blitzes right into Alex Mitchell. And the safety loops around to the outside looking to clean up. Figure 8 shows the action at the snap. There is nowhere for Hart to go. Cut back behind the tackle? Not one but two unblocked players. Shoot between the weakside guard and the center? The reason the weakside DT was rolled up so close to the center was so that he, much like Landri on our first play, has the advantage over a guard poorly positioned to stop him. Attack the outside? The safety is coming to meet you behind the line of scrimmage. So the only thing left to do is what Hart did: follow the nominally designated hole (this is a zone, after all) on the front side and try to cut to one side of Mitchell. This defensive formation and playcall is specifically designed to stop the zone stretch on short yardage. Moreover, it's specifically designed to bait Chad Henne, who is always given the option to check into another play, into reading the defense and going ahead with the doomed stretch. The cavernous gaps on the line. The linebacker seemingly misaligned on the weakside. All you need is a yard and you can see said yard materialize if Alex Mitchell can just take one or two steps forward. But, as Admiral Ackbar might say, it's a trap! Figure 9 shows the play's demise. Kerr uses his momentum to stalemate Mitchell at the line of scrimmage. This is a victory for him as it allows him to read where Hart is going and shuck the OL, who he has control of, when the time comes. By this time Vernon Gholston has driven the TE, Massey, far enough back that the corner is not an option. The safety reads this and comes inside. Long disengages from his Gholston double to get a block on him, allowing Gholston and Kerr to converge on Hart in the backfield. Hart being Hart, he spins out of the double tackle attempt, but it's too late once his momentum stops going towards the line of scrimmage. The totally unblocked James Laurinaitis is suffered to flow down the line of scrimmage and tackle Hart for a loss, causing an enraptured Brent Musberger to wax poetic about another remarkable play from the Buckeye middle linebacker when the gruntwork was done by Jim Tressel, Vernon Gholston, and John Kerr. Michigan would punt; Ohio State would strike for a touchdown and a 14-7 lead they would never relinquish; Michigan fans would become further acquainted with Mr. Tequila. The Michigan run game will probably improve even from its lofty perch of a year ago. Mike Hart, Jake Long, Adam Kraus, and Alex Mitchell return a year better and more experienced. And though Michigan's opponents now have a full season of tape on the new run game and are themselves a year more experienced defending it, conference foes were already acquainted with the style to begin with: since Iowa's been running mostly zone stretches since the days of Fred Russell. The two new starters on the offensive line have higher ceilings than the men they replace. Mark Bihl was a pleasant surprise in last year but didn't receive any postseason recognition or NFL attention. Though Rueben Riley battled his way to an okay year, he was similarly overlooked. Most of the time he looked like a guard trying really hard to play tackle. On the other hand, projected replacements Justin Boren and Steve Schilling are on stardom tracks. Boren was the first Michigan offensive lineman in recent memory to not redshirt. Schilling is Michigan's highest rated offensive line recruit in a long time and one who spent his days playing right tackle in a veer option that prized his incredible agility. If you wanted to draw up a player designed to be a right tackle in a zone running game, it would be him. After an adjustment period they should both be very, very good. The only position that is worrisome is tight end. Presumptive starter Mike Massey is still under 240 pounds and has been an indifferent blocker thus far in his career. The two-tight-end sets Michigan deployed frequently a year ago will be difficult to replicate. Massey's only backups are untested position-switchers and freshmen. Unfortunately, Michigan seems ill-prepared to reverse the ugly short-yardage trend in 2007. As noted, Michigan is paper thin at tight end and may be even thinner at fullback, where a true freshman and a walk-on battle a converted linebacker to replace Oluigbo. Options in short yardage packages are few and far between and, as demonstrated, the stretch is not an effective play when it makes sense for a defense to sell out against it. Ideally, Michigan would identify this weakness and fix it, either by tweaking the zone game or incorporating some good old fashioned smashmouth iso plays when the situation calls for it. Realistically, performance on third and short is likely to be an issue again. The Michigan coaching staff has a tendency to stubbornly bang their heads against the wall well after it becomes evident that what they're trying isn't quite working. Still, Michigan seems poised to enter the top twenty rush offenses in the country and average better than five yards a carry in only their second year in the new system. Whatever its flaws, the zone has been a gamble that pays. NCAA Division 1 Football Statistics. 2006. 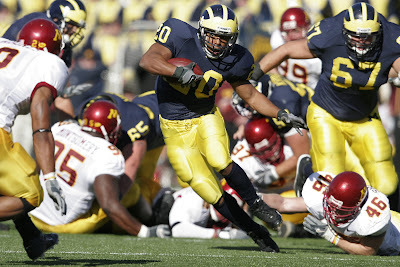 MGoBlog, “DIY Third Down Stats 2006,” February 16, 2006. When you're a blogger, stupid post ideas flit through your mind on a daily basis: "college football programs as cheeses!" or "4,000 words on the construction of authority and why it's still weird when people ask me questions." One of the very stupidest ideas I ever had was a recent one: "I will present myself as a guinea pig and go through a Barwis workout." I said it was stupid. That was after nine minutes. Add a significant amount of hair, subtract three minutes, and add some dangling organs I have forcibly ejected from my body and are currently being nipped at by Barwis Wolves and you have the probable result of Worst Idea Ever. So thanks for that, Mr. Hall-Swindle. I owe you a beer and maybe a kidney. The mode of thinking this morning after talking with the trainers I’m “working” with (read: being maimed by) is that the only possible reason any discrepancy might exist between the SEC and the Big Ten is talent development. That’s it: not schemes, not odious theories involving weather, nothing but the training they receive and the varying emphases different programs build into their training programs. We’re brewing up a piece on this at SN, but in short think of player development in college football as one exaggerated episode of Top Chef: when everyone’s working with the same produce, how you cut it up and prep it makes all the difference at the margins. Bringing us to the future, a.k.a. the West Virginia/Michigan training program. I mentioned Michigan's superb record against the SEC above; now consider how well Michigan did using training techniques from the 1970s, as it did until this year's complete revamping of the training program. Michigan is now busy reprogramming its players to play in the 21st century, demanding speed at every position (yes, even for pizza-mobbing offensive linemen) and totally rebuilding their talent development system. Two thoughts crossed my mind as we finished drills: One, that not vomiting on day one represented a substantial accomplishment for a squishy blogger; and two, that if Michigan did as well as it did with old training methods, the possibilities for the Wolverines under a newer, speed-obsessed regime remain both frightening and limitless. Mike Barwis went from a respected but obscure S&C coach at West Virginia to the head of a cult he had no hand in creating. 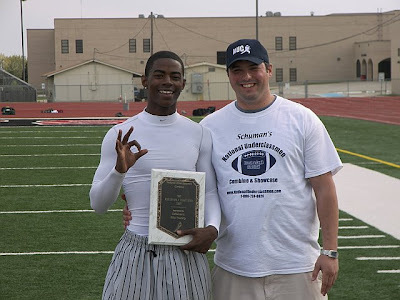 He is the highest paid and probably the most famous trainer in the country. There is an "eeee I'm a little girl for Mike Barwis" tag on this blog, and it is only half-sarcastic. Can he possibly live up to the hype? "In terms of players we see for the combine, the best-conditioned and prepared athletes by conference come in this order: the SEC, the Big 12, the Pac-10 is just a little bit under that, and then the Big Ten brings up the rear." ...oops. Add up all the bowl games the two sides have played against each other in the last eleven* years and the SEC is ahead 15 to 14 with most of the damage being done against Ohio State, 0-4 in that timespan and 0-7 since '91. Clearly, being fast -- if SEC teams actually are, which is debatable -- is not a magic ticket. On the other hand: holy hell did West Virginia look fast, and with functionally zero four-star or better recruits. Under Rodriguez, West Virginia outperformed its recruiting rankings every year, assembling team after team somewhere between good and great without the benefit of more than one or two guys a year with any shot in the NFL. Barwis had a hand in that just like Gittleson had a hand in Gabe Watson's failure to live up to his potential. The thing that excites about the transition is the sheer gulf between Gittleson, Carr, Debord, et al., who were all decent enough in their time but by 2007 were reduced to shoving an unmotivated, out of shape Alex Mitchell onto the field against Ohio State, and the Rodriguez/Barwis regime, where Mitchell would be laughed off the team. It's not so much the new training techniques that excite but the demand that team members participate in offseason workouts even you're a starter and Daddy has a landscaping business. The offseason is optional: so is playing time. Over time, everything in your program is shaped by the attitude you bring. 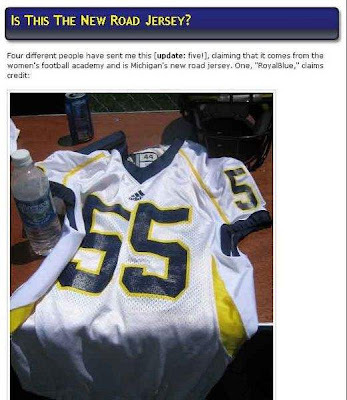 Michigan recruits are committing in the full knowledge Barwis is going to kill them, and they are eager to be killed. In time, this will manifest itself and the only things separating Michigan from national title games will be blind luck and Jim Tressel. Last year, there was a book, and it was good. This year there is a book, and it's probably even a little better. You can order it here. Stuff by me. I preview the Michigan offense, defense, and special teams, which is even better than last year, when I totally forgot about special teams until the book was full. HTTV: now with special teams. Rad. 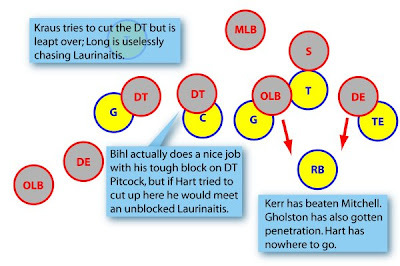 I also take a quick trip through Michigan's recruits and reprise last year's zone running article with a version focused on the spread 'n' shred. Stuff about opponents. Matt Hinton, who you probably know better as Sunday Morning Quarterback, provides a rundown of every Michigan opponent save Ohio State and Notre Dame. Those two get their own articles by Tom Orr, late of Michigan Monday at the OZone, and Brian Stouffer, Fanhouser and impresario of The House Rock Built. Stuff about the new guys. Dan D'addona gives you the Rodriguez dossier from Glenville State to Pat White, Russ Levine takes stock of the program at a fulcrum point, and Christopher Paul Anderson looks at blitz-mad defensive coordinator Scott Shafer from his perspective at Stanford. Stuff you won't find elsewhere. 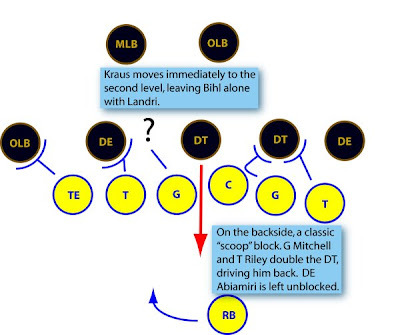 Michael Elkon of Braves and Birds took an in-depth look at how the top coaches in the country did in their first years out and Colin Johnston, who you may remember from the comments section of this blog or his own endeavor, expands upon the hours he spent researching/lamenting Michigan's linebacker play, breaking down in just what ways Obi Ezeh needs to improve if Michigan's going to avoid getting run over by Wisconsin and Ohio State this fall. In the history department, Joel Pennington takes a look back at the 1969 Ohio State game and Greg Dooley of MVictors has a special Depression-era edition of his eBay Watch. It caused Rocky Mountain News columnist Paul Campos to pen an entertaining piece about the insane few weeks in between Carr's resignation and Rodriguez's hiring, during which any one of us would have beaten a man to death with his own limbs if it meant the coaching search would reach a satisfactory conclusion. It allowed local author Craig Ross to finally publish a piece about his attendance at a Scot Loeffler-run quarterbacks meeting. 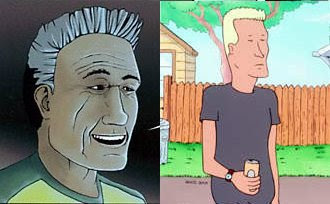 And it paved the way for Johnny of RBUAS to interview Carr himself. All three pieces are terrific. THERE IS ALSO A ROSTER. Sweet. You can order it here, or here, or here, or here. Those are all the same place. Over the next couple days I'll republish last year's zone article, which features heavily in this year's zone article, and provide a couple excerpts. ...I doubt Lionel Mitchell probably thinks very much of the crunch. I have zero clue how severe his back injury might be, but either a) it's hella severe, career-threatening, painful as anything, and still even 'Bama fans are writing things like "If I had to wager, I would bet there's nothing wrong with his back" and believing he was just too crappy to keep his scholarship; b) it's not that severe, but rather than wait and see if he could come back from it and contribute, his coach has told him his career's over anyway. Neither seems like a scenario that would make Lionel Mitchell happy. Second: I certainly don't blame 'Bama fans for not wanting to put the 2 of Lewis's surprise academic disqualification--which even OTS said was "dumbfound[ing]," "never made sense," and left him with "no clue"--and the 2 of "'Bama needs scholarships" together. Also at the FanHouse: if you have Time Warner you may be getting good news about the Big Ten Network soon. Looking at the RichRod saga now through the prism of knowledge of the utter disaster that is the Garrison administration, it is apparent that they ran Rich off. I believe Rich is telling the truth when he said the entire relationship changed when Garrison took over. His relationship with Pastilong changed. His relationship with Garrison changed. And, before you know it, Garrison was wanting to show he was the new Sheriff in town and he wasn't going to accept ANY ADDITIONAL demands of Rich Rodriguez. Michigan lucked out because West Virginia is the sort of backwards place where the governor can appoint an unqualified unversity president the entire faculty thinks is a dolt, and that president and his athletic director can poison their relationship with one of the best coaches in the country. Rodriguez fell into our laps just when we were going to start scraping the bottom of the barrel. First, one thing I can't take is just how often Rich refers to himself in the third person. That is such a bad habit, someone needs to break him of it, it's tough to listen to him say "Rich Rodriguez" over and over. Bob Palcic was in 'Nam! The Big Ten Conference generated more than $177 million in revenue during its 2006-07 fiscal year, according to documents filed this month with the Internal Revenue Service. Anyone got the full monty on this? I assume it has interesting Big Ten Network details. Yes, son, at the moment of your glory the camera focuses on... Phil Knight! 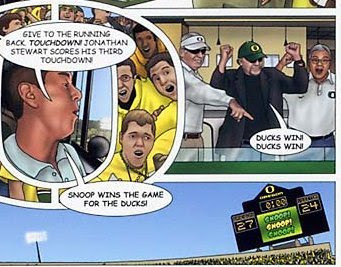 The comic's "plot" consists of a kindly old grandfather telling his towheaded little brat all about the legend of "Snoop," AKA Jonathan Stewart. That grandfather is... familiar. Ga na gon na ga that's right. As I broke down the film of Michigan’s offense in '95 I thought there was a possible tendency with the center’s non-snapping hand. I went back and checked every snap and sure enough the tendency was about 95% that when his hand was on the ground it was run and when he had it on his thigh it was pass. This was not signal stealing, this was just a tendency found way before the game was even played. But it was a GREAT help for our defense. (As a GA I was in the coaching booth for games and was not stealing signals.) This is not exactly unfair tactics on our part but more of an error on their part. Either they coached the center to do the hand thing or the kid was doing it himself and their coaches never noticed. Either way it was their own fault. That speaks to a certain complacency, I think. I wonder how many other teams noticed? Etc. : normally I am a Michael Rosenberg fan but I have to agree with BSD and their fisking of his BTN-Comcast column. Said column made no sense. Vijay's trying to figure out if ESPN's any better at ranking players. Autumn Thunder makes a triumphant return. More pictures of stuff, this the football practice facility. Overall, Barnes is ideal for a team struggling to slow down two-back, power-running schemes but could have difficulty playing cutback versus heavy zone teams. Tough, strong and physical with good short-area burst; should be very productive in the middle for a tradition[al] 4-3 team. The 6-foot, 225-pound prospect recorded 146 tackles in 2007 with 38 tackles for loss. Your standard "save me, Jebus" stuff. Upside is the word of the day here. That SPARQ score is super high, especially for a linebacker. He's not that far away from a four-star ranking on Rivals (he's the #20 ILB and #17 has the fourth star) and could get that if he performs up to his combine numbers this fall. A fun biographical fact: Barnes is the son of former Lions LB Roosevelt Barnes. Peace is the guy on the left. I hope. Peace, the MVP at his position from South Grand Prairie, will be one to watch. His ability to make the tough catch despite going against a very aggressive group of DB's was impressive. With just two offers in hand from Kansas and SMU, things should continue to grow in the recruiting arena. There's also some fluffy stuff over at something called Prep Ticket. And that's all there is on young Mr. Peace. At 6-foot and 160 or 170 pounds Peace could be ticketed for defensive back or wide receiver. Hi Brian, how are you? quick question for you...in short, why in the F are we recruiting all of these three star athletes like Dewayne Peace and jordan Barnes? what decision does this kid have to make? Isn't it a no brainer he is going to Michigan? The only question is, why do we want the 76th best wide receiver? We are Michigan, shouldn't we be settling for a LOT better? Talk to me goose....make this right in my head so I can stop fuming! Every school takes guys rated at about Peace's level when they find them and like them enough to offer. Even Ohio State's admittedly monster 2009 class has Adam Homan, Rivals' #38 MLB, Zach Boren, the #64 "athlete," and Duron Carter, the #73 wide receiver. In general, I'm okay with camp commitments since they come after an extended look at a prospect and his abilities. When Michigan has Peace on campus for a week they probably know much more about his abilities than the recruiting gurus -- working off a day camp here and there and maybe some highlight video, of which Peace doesn't have much -- do.